Barb Samardzich, Ford's vice president of powertrain engineering, will be vice president of global product programs. DETROIT -- Ford Motor Co. today named Paul Mascarenas its new chief technical officer and vice president of research and advanced engineering, replacing Gerhard Schmidt, 64, who is retiring Feb. 1. Mascarenas, 49, had been vice president of engineering and will take on the new role Jan. 1. 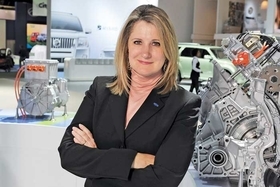 • Barb Samardzich, 52, vice president of powertrain engineering, will be vice president of global product programs. • Hau Thai-Tang, 44, director of product development at Ford's South America operations, will become executive director of global product programs. 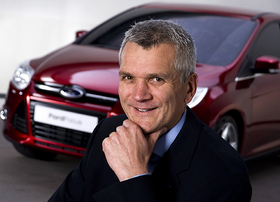 • Ingvar Sviggum, 65, vice president of marketing, sales and service at Ford of Europe, will retire. He will be replaced by Roelant de Waard, 48, vice president of sales at Ford of Europe. • Joe Bakaj, 48, vice president of global product programs and product development at Ford of Europe, will be vice president of powertrain engineering. • Raj Nair, 45, vice president Asia Pacific and Africa operations, was elected an officer of the company and appointed vice president of engineering. An earlier version of this story reported the wrong age for Raj Nair. He is 45. Ford's Paul Mascarenas will report to Derrick Kuzak, head of global product development. Ford Motor Company (NYSE: F) today announced the retirements of two company officers as well as a series of executive appointments that will further strengthen Ford's global management team in support of the company's One Ford plan. Gerhard Schmidt, Ford's Chief Technical Officer and vice president, Research & Advanced Engineering, will retire Feb. 1, after 10 years with the company. Schmidt, 64, a former executive with BMW AG, has led Ford's worldwide research organization based in Dearborn, and Aachen, Germany. Ford's Research and Advanced Engineering staff of scientists, engineers and technicians is dedicated to supporting the company as a leader in providing safe, sustainable and affordable mobility through innovation in science and technology. "Gerhard has been a visionary leader for Research & Advanced Engineering," said Derrick Kuzak, Ford group vice president, Global Product Development. "Many of the technologies that are now changing consumers' views of Ford - EcoBoost, state-of-the-art diesels, SYNC - all had their roots in Research & Advanced Engineering. Gerhard's commitment to customer-driven technology and an unrelenting drive to see that technology in our production vehicles has left a lasting imprint on all of us, and just as importantly, on our processes." Succeeding Schmidt as Chief Technical Officer and vice president, Research & Advanced Engineering will be Paul Mascarenas, 49, currently Ford's vice president, Engineering. He will report to Kuzak. Ford also announced that Ingvar Sviggum, vice president, Marketing, Sales and Service, Ford of Europe, will retire Jan. 1. Sviggum, 65, was appointed vice president, Marketing, Sales and Service for Ford of Europe in April 2008. Prior to that, Sviggum was vice president, European Sales Operations for Ford of Europe. He joined Ford Norway in 1963 as a trainee. "Ingvar has made a huge contribution to Ford in his close to half a century of service with our company," said Stephen Odell, chairman and CEO, Ford of Europe. "He has a wealth of experience and knowledge that is unrivaled and has shown throughout the years a true passion for the business and a talent for leadership." Sviggum vice president, Marketing, Sales and Service, Ford of Europe, will be succeeded by Roelant de Waard, 48, currently vice president, Sales, Ford of Europe. De Waard also is appointed an officer of Ford Motor Company. He will report to Odell and Jim Farley, group vice president, Global Marketing, Sales and Service. • Barb Samardzich, 52, vice president, Powertrain Engineering, is appointed vice president, Global Product Programs. Concurrently, Hau Thai-Tang, 44, director, Product Development, Ford South America Operations, is appointed executive director, Global Product Programs. • Joe Bakaj, 48, vice president, Global Product Programs and Product Development, Ford of Europe, is appointed vice president, Powertrain Engineering. • Raj Nair, 45, vice president, Operations, Ford Asia Pacific and Africa, is elected an officer of the company and appointed Vice President, Engineering. • Frank Davis, 49, executive director, North America Product Programs, is appointed vice president, Product Development, Ford of Europe. Davis will report to both Odell and Kuzak. • Matt O'Leary, 55, director, Corporate Strategy, is appointed director, Product Development, Ford South America Operations, replacing Hau Thai-Tang. O'Leary will report to Kuzak and Eduardo Serrano, executive director, Latin America. "These moves further strengthen our Global Product Development team as we continue to accelerate the development of new vehicles around the world that customers truly desire with the best quality, fuel efficiency, safety, smart design and value," Kuzak said.